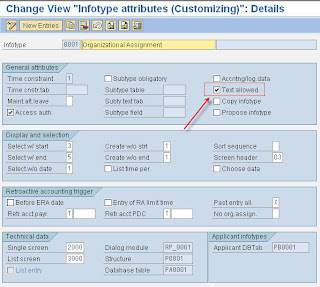 Out of the box functionality, you can type in comments through PA30 on some of the infotypes. But how do you have this cool feature for other infotypes, such as custom infotypes or infotypes not automatically default out of the box? Select the infotype you want to maintain and select "Text Allowed". Whoa la! it was and is very useful fro me. Great jobs keep updates see sap groups for global social networking.